CHECK OUT "ROOTY" IN THE NEW PDJ! I thought I would give you all quick plug on my first published article, “Rooty,” in the March/April 2009 Pointing Dog Journal. For those who do not know, Rooty, a GSP, was my first birddog. The article is only one page long, but I think it is a good tribute to a great birddog. Fittingly, the GSP on the magazine’s cover coincidentally looks a lot like Rooty Boy. I hope people enjoy his story and that this article is the first of many good things to come. And to think, it all started here in this blog. Thanks for all the comments, support, and encouragement. 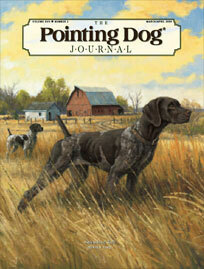 For lovers of Pointing Dogs, there is no finer magazine that the PDJ. Check it out, you will not regret it! I can’t wait to read it. I’m sure my PDJ is just sitting in my mail box in logan and I’m getting that anxious feeling to read it. Andy…enjoyed the article very much. Inspired me to pull out some old journals and reflect on my first pup. Thanks!